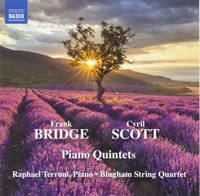 Description: Scott’s early quintet first came out 13 years ago on Dutton Epoch (04D057). A large-scale work (the work had several revisions and was premiered in 1920 - its actual composition date is unknown) lasting 38 minutes, it is very ambitious and harmonically daring for its time. Entered for a competition, a panel of judges which included Vaughan Williams (who called it 'very long and rhapsodic' and 'it has power and passion and ought to rank high') and another, obviously more conservative judge who observed only 'This is queer work.' Impressively romantic and poetic, this will be a treat for piano-chamber-music collectors. Those of you repelled by the Dutton price now have a mid-price opportunity with this 1989 recording, never released in the U.S. and only on cassette in the U.K. Raphael Terroni (piano), Bingham String Quartet. Original 1990 British Music Society release.